On the heels of our Banner Mediation announcement earlier in August, we’re happy to announce the addition of Hybrid Interstitials as another enhancement to the unified Fyber and Heyzap platform. To address the complex needs of today’s mobile developers, Hybrid Interstitials offer creative flexibility that helps optimize revenue opportunities and manage the user experience. So how does this work? 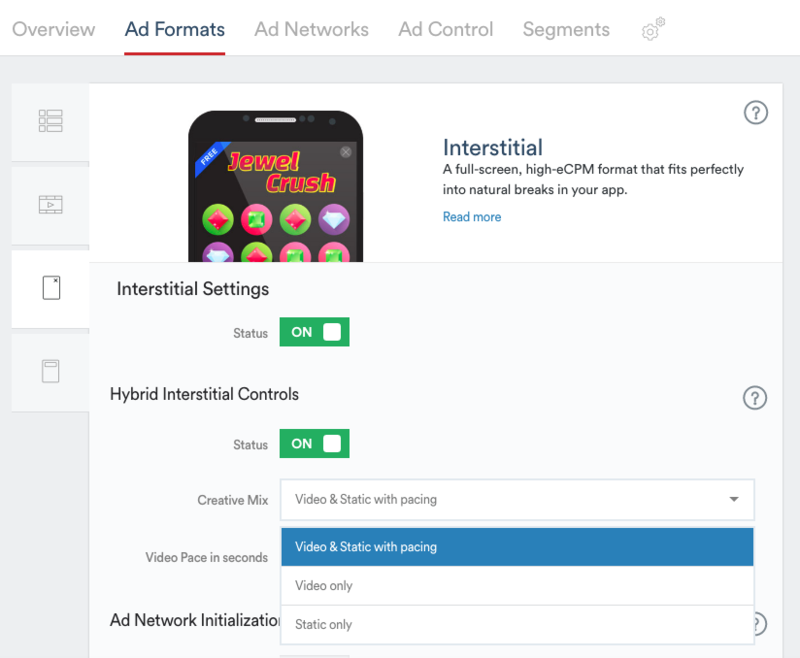 By default, Hybrid Interstitial controls are set to optimize for the highest paying ad, regardless of whether the creative is static or video. You can also easily take charge of the user experience by setting creative delivery rules to show only video ads, only static ads, or a mix of video and static ads with pacing. Does your app have fast gameplay that requires minimal interruption? Then consider static-only interstitials. Want to use both static and video for your app? You can implement both and avoid user fatigue by pacing the video creatives so that they only appear within a certain frequency. With guidance from Fyber’s monetization experts, you can test different options to find the ideal balance for your app’s incoming revenue and UX. Along with Hybrid Interstitials, publishers can leverage other Fyber features to deliver great experiences for users including User Segmentation, Content Filters, and more. Fyber publishers can visit the “Ad Formats” and “Interstitials” section of the Developer Dashboard to access Hybrid Interstitial controls. If the controls are turned off, Fyber will automatically deliver the highest paying ad from a variety of creatives. Turn the controls on to test out different creative mixes. This is just one of many product updates to the Fyber and Heyzap unified platform. See an overview of our upgrades, or contact [email protected] to get started.